‘The flu vaccine given to millions of people in the UK barely works, health officials have admitted, amid warnings that the number of deaths this winter will be the worst for 15 years. Public Health England (PHE) warned that the main strain of influenza in circulation – which is particularly lethal among the elderly – has mutated from the type that was used in the jab. The alert follows research on more 1,300 patients hospitalized with flu in the UK. Latest figures show that the number of “excess deaths” this winter – those caused by flu and cold weather – is one third higher than average. 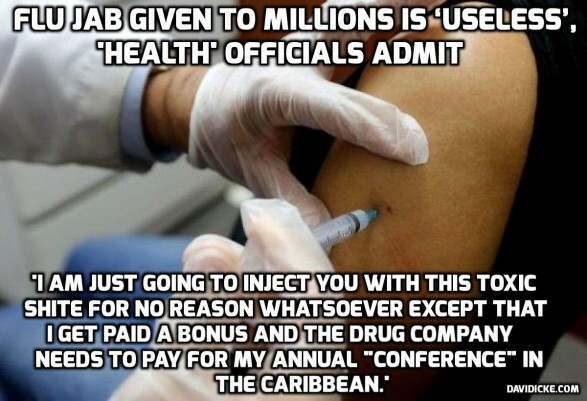 Be the first to comment on "Flu jab given to millions is ‘useless’"